One by one, they arrived at Jackson Memorial Hospital. 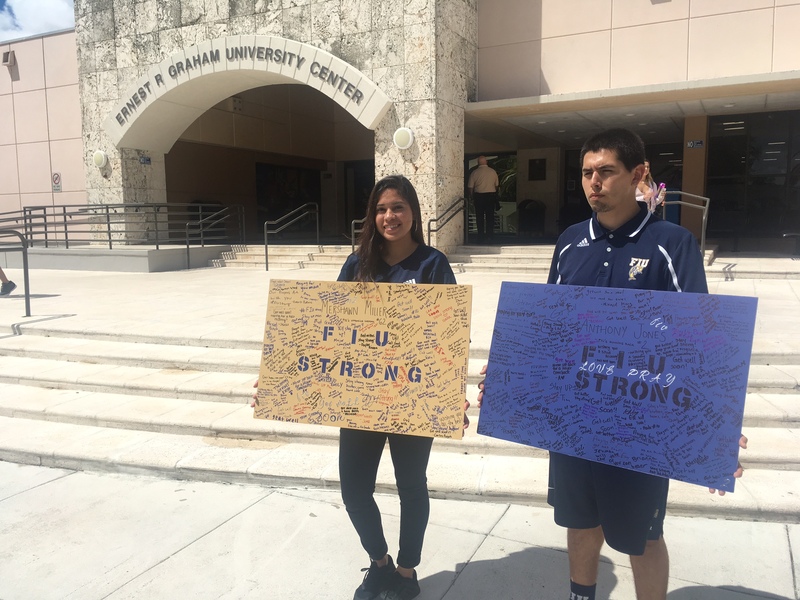 The FIU community was pouring in to offer their love and support for their fellow Panthers. 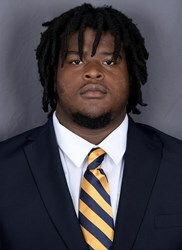 Senior running back Anthony Jones and his teammate, freshman offensive lineman Mershawn Miller, were shot in a drive-by attack in Opa-locka on Sept. 6. Jones was airlifted to the hospital in serious condition. Miller was shot in the arm, released from the Miami hospital overnight and is in recovery. FIU News spoke with Jones’ mother, Betty Cook, at the trauma center on Sept. 7. She was proud to talk about the friends, family and community that came to Jones’ side. Cook was at her job at Gordon Food Services when she first heard of her son’s shooting. She rushed to the scene in Opa-locka and was told that he would be airlifted to Jackson Memorial Hospital’s trauma center. She drove there and had been there for 24 straight hours. Arriving shortly after Cook was head coach Butch Davis and his staff. According to Cook, more than half of the football team was there. They filled the lobby and spilled outside. “The receptionist was like, ‘Oh my god, I cannot believe this,’”Cook said. The way events have unfolded since the shooting seems like a miracle. Her son is going to be alright. She said the bullet went through his shoulder, grazed his neck and exited in the cheekbone area. He was awake with his medical tubes out and talking on Sept. 12. “He can speak. He can see. He has no damages, nowhere — no arteries, no muscles, no nothing. Amazing. God’s grace and his mercy protected him,” Cook said. The FIU community has shown up one after another to check in on him. President Mark B. Rosenberg, who was out of town on a business trip, sent representative Javier Marques, the vice president for Operations & Safety and chief of staff of the President’s Office, to spend time with the families. The president was kept up to date on Jones’ condition by Executive Director of Sports and Entertainment Pete Garcia and coach Davis. Joining Cook at the hospital last Thursday was running backs coach Tim Harris Jr., who came, left to talk with the team and returned later that night for the surgery. He stayed until 11 p.m.
“[The players and staff] have been texting me all day today. ‘Is he OK? How is my boy? Tell him we love him. Tell him we’re praying for him.’ Just phenomenal people,” Cook said. Staff from his alma mater, Miami Central High, called from Washington, D.C. Coaches from Booker T. Washington and other south Florida high schools did, too. “Anthony has been playing football since he was four years old at the park, so coaches know him from everywhere,” Cook said. Rosee Rodriguez and David Puron of the Sunblazers fan group filled two signs up with well-wishes for Miller and Jones. The Sunblazers, an FIU fan group, brought Cook a poster signed by more than a hundred students to give to her son. “It’s extremely important to stick together as an FIU community and have our brother’s back. We are a family here at FIU and nothing will break the bond we have as Panthers,” said Alec Dominguez, president of the Sunblazers and a senior FIU cross country runner. Former FIU running back Alex Gardner called. Chief of FIU Police Alexander Casas was there. His grandma, grandfathers, aunts, uncles, cousins, nieces, nephews and close friends came. Pastor Lavern Williamson of Pentecostal Church of God was there, too. Cook says Jones watched the Panthers’ comeback win against Old Dominion from the hospital. 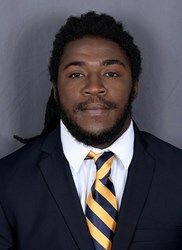 He still has a ways to go before he joins them again on the football field, but this is not the end for the FIU running back. Awesome! Glad to hear that he will be okay. I’m proud that F.I.U. showed so much support.